Welcome to the Affiliate Ninja Mom resources section. This page lists my recommended tools for building and getting the best from your blogging or affiliate marketing business. I've tried out all the tools below and only recommend resources I trust or use myself. Please note: This page contains affiliate links. This means I may earn a small commission if you decide to make a purchase. This does not change the cost for you at all though. If you do choose to buy something, many thanks for your support! Wealthy Affiliate is by far my favourite training resource for affiliate marketing. It's perfect for beginner's and you'll learn step-by-step how to build a successful affiliate marketing website from scratch. I highly recommend the FREE Starter Program if you're new to affiliate marketing, because it includes everything you need to start your first affiliate website. Want to build your own blog on WordPress? 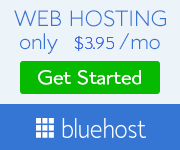 Bluehost make it ridiculously easy with their one-click WordPress installation. My step-by-step tutorial can help get you up & running in no time. When you're ready to invest in a premium paid theme, I highly recommend the Genesis Framework by Studiopress. They create WordPress themes that are hard to beat for SEO, design, performance, security and support. I use Foodie Pro on this site, but there are a bunch of great themes to choose from. LongTail Pro is my favourite tool for finding profitable keywords to target in my blog and affiliate marketing posts. Many keywords are very competitive, but Long Tail Pro shows you exactly which keywords people are looking for in search engines, including the low competition 'long tail' ones that are easier to rank for. This can save you a lot of time and ultimately make you more money, as you're not stabbing in the dark trying to decide which keyword phrase to target. Long Tail Pro is easy to use and it's hands down the best keyword research tool I've found.